Apple iPhone 5 set for September release? 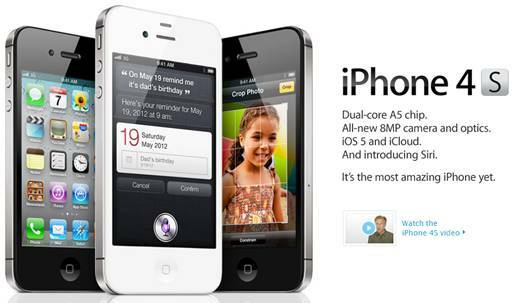 Apple’s iPhone 5 will launch this September with a faster processor and an improved camera, according to recent reports. The latest version of Apple’s flagship product will upgrade to the A5 processor used by the iPad 2, while the five-megapixel camera will be replaced with an eight-megapixel version. The new reports follow Apple’s Worldwide Developers Conference (WWDC) in San Francisco earlier this month, which has traditionally been the backdrop for the unveiling of the latest iPhone since the first iteration was introduced by Apple CEO Steve Jobs in 2007.However, the WWDC proved to be software-focused, with iCloud and iOS 5 taking centre stage. Industry speculation now suggests that the iPhone 5 will launch in Q4 of 2011. Notification Center: With Notification Center, you can keep track of new email, texts, friend requests, and more – all in one convenient location. iMessage: Apple have created a new messaging service for all iOS 5 users. You can send unlimited text messages via Wi-Fi or 3G from your iPad, iPhone, or iPod touch to anyone with one of those devices. Newsstand: iOS 5 organizes your magazine and newspaper app subscriptions in Newsstand: a folder that lets you access your favorite publications quickly and easily. Reminders:Reminders lets you organize your life in to-do lists — complete with due dates and locations. Twitter: Integrated right into iOS 5. iOS 5 makes it even easier to tweet from your iPhone, iPad, or iPod touch. Camera: Enhanced features include grid lines, pinch-to-zoom gestures, and single-tap focus and exposure locks to compose a picture on the fly. Photos: Enhanced photo enhancements. Turn your snapshots into frame-worthy photos in just a few taps. Crop, rotate, enhance, and remove red-eye without leaving the Photos app. Safari: iOS 5 brings even more web-browsing features to iPhone, iPad, and iPod touch. Safari Reader displays web articles sans ads or clutter so you can read without distractions. PC Free: Independence for all iOS devices. With iOS 5, you no longer need a computer to own an iPad, iPhone, or iPod touch. Activate and set up your device wirelessly, right out of the box. Mail: You can now format text using bold, italic, or underlined fonts. Searching and Organising emails has also been improved. Calendar: Tap to create an event and drag to adjust the time and duration. Add, rename, and delete calendars directly from your device. And view event attachments without leaving the Calendar app. Game Center: Gaming experience has been improved. Wi-Fi Sync Wirelessly sync your iOS device to your Mac or PC over a shared Wi-Fi connection. Multitasking Gestures for iPad: iOS 5 includes a few new moves and shortcuts to help you get around even quicker on your iPad. AirPlay Mirroring for iPad 2: You can wirelessly — and securely — stream whatever’s on your iPad 2 to your HDTV via Apple TV. Accessibility: iOS 5 comes with innovative new features that make it easier for people with mobility, hearing, vision, and cognitive disabilities to get the most from their iOS devices. The Wall Street Journal has published a report that Apple is working on the first of a new line of less-expensive iPhones and an overhaul of software services for the devices. Sources told the WSJ that Apple is preparing to roll out a series of lower-priced iPhones to compete with other smartphones on the market. The new models will apparently be about half the cost and size of existing iPhones. WSJ was unable to find out when the new handset might be introduced but it is usual for Apple to release any new devices to the US market first. Apple is also reported to be exploring a major revamp of its MobileMe online storage service. The service, which lets users store data in a central location and synchronize their calendars and contacts among computers and other devices, currently has an individual annual subscription fee. Apple is apparently considering making MobileMe a free service that would serve as a “locker” for personal memorabilia such as photos, music and videos, eliminating the need for devices to carry a lot of memory.